Arlington, Virginia takes bicycling seriously. It partnered with Washington D.C. to create arguably the most successful bikesharing network in the U.S., Capital Bikeshare. Arlington contains more than 100 miles of multi-use trails, on-street bike lanes, and designated bike routes over a relatively small 26.1 square miles of space. Biking isn’t just about lanes and trails. It’s also about bicycle parking facilities. County officials understand that biking reduces automobile congestion, and that people are more likely to bike if they have access to quality, safe bike-parking facilities both at home and at work. Developers realize that bike amenities are a good way to differentiate their properties in a crowded marketplace. And businesses understand that quality bike parking facilities result in increased revenues. Arlington now contains more than 5,000 bike-parking spaces as a result of its development review and approval process. The county’s commitment to cycling is shown in the attention it pays to the construction of these facilities, as specified in its Guide to Effective Bicycle Parking for residential and commercial buildings, updated in February 2014. The guide is intended to inform developers, contractors, planners, architects, and property owners in Arlington regarding the construction of high-quality parking that encourages cycling. The following 10 rules are derived from the guide’s more expansive list of specifications. However, these rules aren’t just applicable to Arlington’s development community. 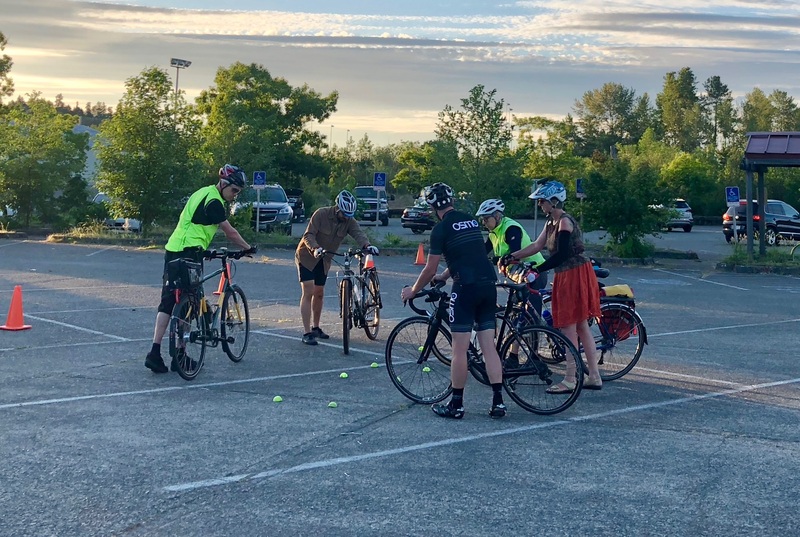 They can also be used by community members as a way to recognize quality bike parking, or by non-Arlingtonians who would like to leverage the county’s expertise in state-of-the-art bike facilities in their own communities. Class Matters. Understanding the classes of bicycle parking is an important first step. Class 1 bicycle parking is secure bicycle parking, intended for building tenants – residents or employees. Class 1 bike parking is characterized by protection from the weather and protection from theft via two levels of security: a locked enclosure as well as racks within the enclosure to which bikes can be locked. Class 2 and 3 are short-term visitor bicycle parking, typically outdoors. Class 2 is covered, and Class 3 uncovered. While Class 2 and 3 parking is less secure, it is more convenient for visitors and customers for short stays. Emphasis in Arlington is largely on Class 1-style bike parking. Location Matters. There are four kinds of secure bike parking in Arlington. From most to least preferable, they are (a) fully enclosed ground-floor room with sidewalk access; (b) fully enclosed room in a garage; (c) cage in a garage; and (d) bike locker. If inside a garage, it is important that the parking location be close to the garage entrance and elevators serving the building. Visitor/customer bike parking should be located on the sidewalk near the visitor/customer entrance. Design Matters. At least 30 percent of all secure bike parking must be horizontal and at ground level, to make sure it can be accessed by those of all ages and physical abilities. Keep in mind that aspects of design such as layout, lighting, and signage can influence whether the bike parking gets used. Materials Matter. Gone are the days when a cyclone fence was good enough for a bike cage. It turns out that it is pretty easy to cut and unwind chain link, and therefore steal a potentially $1,000 piece of equipment. If you can’t build your bike room with drywall or cinderblock, then a cage must be built using industrial grade expanded metal or welded wire mesh. Enclosure doors must be hollow metal doors. Space Matters. Minimum clearances are required in Arlington so that bike parking works for all users and all bikes. Examples: Space between parallel u-racks must be three feet, and space from the end of a u-rack to an obstruction must be two feet. Aisles must be wide enough to maneuver bikes onto and off of racks. Tailoring Matters. Tailor bike parking to the user group: Class 1 parking for residents and Class 2/3 for guests. A commercial building needs showers and lockers to support bike commuting as a viable option. Tailor parking to the site as well: underneath eaves or porticos whenever possible. Safety Matters. As Class 2 and 3 (visitor) parking is inherently less secure than Class 1, install the racks in highly visible areas within 50 feet of the main entrance of the building. Bike racks should never be installed in locations that obstruct pedestrian paths or vehicle rights-of-way. Good Plans Matter. Arlington requires submission of detailed drawings of bicycle parking prior to plan approval. These drawings have to show materials and dimensions so that potential design issues can be caught and fixed early in the process. User-Friendly Matters. A user-friendly bike rack is constructed of steel pipe or tubing and is securely anchored to an immovable level surface, provides stable support for a bicycle locked against it, doesn’t place stress on a bike’s wheels, and allows the user to lock both the frame and one wheel to the rack. Management Matters. Even the most well-built bike parking may suffer without attention. Good bike parking management relies on just a couple of things: (a) a property manager familiar with the service who can promote the program and respond to concerns, and (b) a registration process that helps keep track of users and distribution of secure access. The bicycle-parking specifications upon which these guidelines are based can be found on the Arlington County Commuter Services website. Good parking facilities encourage biking, and enhance the community. Whether you are a developer in Arlington or elsewhere, and whether you’re building a new construction or a renovation, these guidelines can assist you in providing high-quality bicycle parking facilities that will set your property apart. Splash photo and story photo by Shane MacRhodes on Flickr. What are Cities Trying to Tell People?